Today is an anniversary, I've been clean and sober 20 months. That's a wonderful gift from the Lord Jesus Christ. I don't claim to be a member of any fellowship, but I will say that I love the twelve steps. They are very powerful. And they're very important to me. 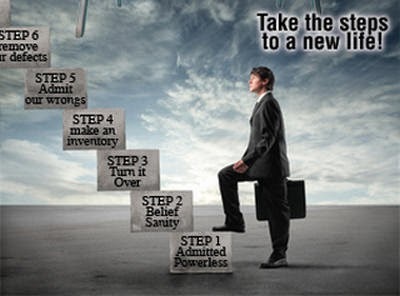 The steps are an incredibly powerful process of transformation. The steps originated in the Bible. How do I know that? The process originated with something called the Oxford Groups. These were Christians trying to return to the roots of Christianity because they felt Christianity was getting off track. Eventually a man named Bill Wilson, a hopeless alcoholic was attending these Oxford groups to try to stay sober, and from there Mr. Wilson wrote the 12 steps. In the 1940s the steps were adapted for people with Gambling problems. In the 1950s the steps were adapted for people with Narcotics problems, and then Over eaters, Cocaine, Nicotine, Meth, Depression, and Codependency. The steps are entirely founded in Biblical principles, providing a Christian with a great road map for the "how to" of living the daily Christian life. Allow me to illustrate just briefly, and I'm just scratching the surface here. The first step is really about surrender. I admit I'm not God. And without a higher power I can't seem to live a decent life. I'm out of control, things are unmanageable and I can't get it right on my own. Surrender ought to be a daily practice of the Christian. How can I submit myself to God? I know of myself I make bad decisions much of the time, admitting that is key. The second step is about coming to believe that God exists and he can help. That can take a moment or a century. It's all up to me, and how much effort I want to place on the process of coming to believe. There are a billion books, scientific evidence, history, audio books, Bibles on every corner, and YouTube for thousands of hours of lectures and talks by great minds. Am I seeking honestly? Am I looking for what I want to find? 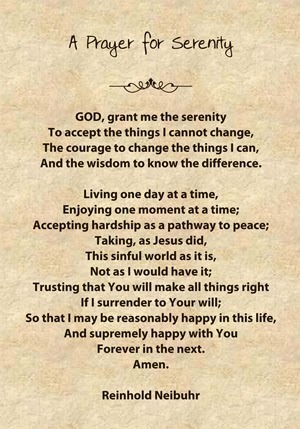 The second part is.. assuming God exists, then I must also believe that he can indeed help me. He has direct upon, he can fundamentally change me. Step three, I turn my life over to God. I try to do it God's way. I ask for his guidance every morning and thank him for it at night. I Give my life to Jesus Christ the savior. Step four, I make an inventory of my decisions and actions. I clear out the garbage within the soul. Step five means I tell the inventory to someone, I speak it out, and let it out, the full truth. And by doing that, my soul is cleared of so much garbage and suddenly, I start to sense the presence of God. It's not that he wasn't there, it's that I was so backed up I couldn't sense him. Step six and seven means looking at the defects of character that showed up in step 4, and I face them. I acknowledge them. Then I ask God for the willingness to have them removed, one by one over time. Step eight and nine is all about getting right with the people around me. Have I hurt family or friends? We all have. We go to those people, apologize, and ask how we can make amends. We get right with people. Step ten, eleven, twelve are the progression of the journey. Step 10 says I continue to work 4 through 9 on a daily basis. I keep up with the process, I make it a lifestyle. It becomes my design for living. 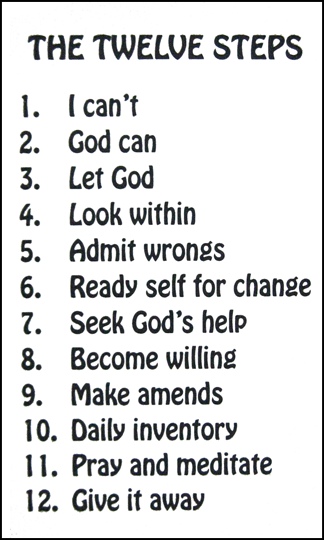 Step 11 means I seek after God. I work on improving my contact with him. I sense him more and more. I pray to him, and I meditate on his word, which means just read the Bible, and think about what it says. And of course step 12, is that I share the message, evangelism, I take the message to others about the good news of Jesus Christ! Not so complicated is it? We admitted we were powerless over our existence —that our lives had become unmanageable. And I'd also strongly recommend purchasing a book on the topic of the twelve steps. There are many, many books that apply the 12 steps to all manner of problems. The 12 steps have really revolutionized treatment of so many problems by applying a simple spiritual solution. Go on Amazon or something and just search for "the 12 steps" or something of that nature. I don't know what your concern is, anything from drugs, alcohol, or depression to simply wanting to live a richer Christian life.